Today was an interesting day. It started out bright and unseasonably cold, then it snowed (?! ), then it rained. Then the sun went down. It was a similar kind of day for me. One of those days where it seems that everyone you work with wants something from you right this very second and theirs is the most important thing! Well I was answering my phone, having people stop by, running up to reception, all while trying to do my normal work (yeah right! ), and trying to also not lose my mind. Then about 230 pm I found myself absolutely RAVENOUS. And worse, my sudden hunger coincided with a MASSIVE craving for junk food. No specific thing--it moved from fries to chocolate to pumpkin lattes--but junk food in general. Normally, I would have given up at this point. Why put myself through that right? But I told myself there was no way I was going to give in. Not at day 4, not at day 40, not at day 94. This time, I'm going to see this to the end. Nevertheless, it was very hard to do! I felt kind of sorry for myself, but also very determined, and in the end I had a bit of protein powder and water, and an orange. It didn't really fill me up, but it helped take the edge off. 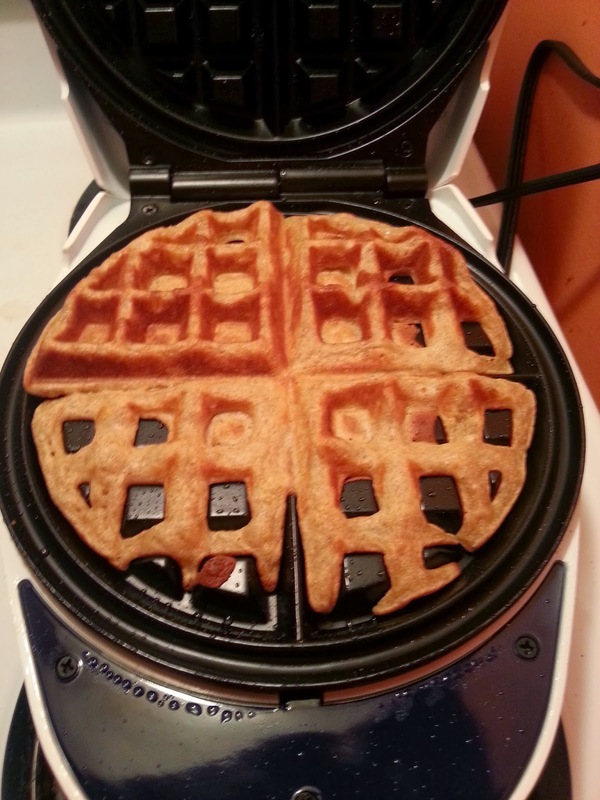 On another note, I bought an inexpensive waffle maker today! I've been considering it for literally the last few years, and today I finally got it. I figured that since I LOVE LOVE LOVE waffles, and the commercial frozen ones are BAD BAD BAD for you, I'd buy a waffle iron, because I know for sure there are really great clean, real food recipes on the Web. Head off the unhealthy cravings by having delicious healthy versions ready to go! I'm even thinking about making a few ahead, and freezing them. That way they can be ready any time! Aren't I brilliant?! 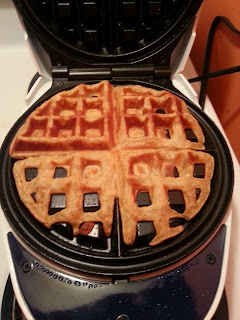 Zombie waffles they may have been, but they sure didn't taste like zombies! 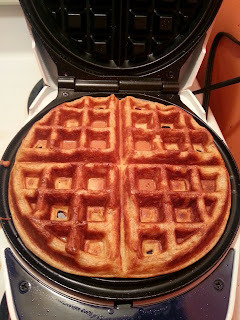 Well, I haven't really made a lot of meals out of zombie parts (only a few really...just kidding), so I don't really know what zombies taste like, but my very first 2 me-made waffles were delish! I couldn't believe it! Honest! Yesterday I had to top up my groceries, while still working through the fresh stuff already in my fridge. I bought organic old cheddar, sourdough whole grain bread, 2 packs of fresh mushrooms, and a 2 lb bag of yellow onions. I keep wanting to buy random stuff that calls my name, but if I don't want to be eating freezer frost and dust bunnies for the last couple of days of the week, I can't be spending my money on impulse purchases! I will have more money at the end of this week than I likely will any other week, owing to 1) that my week started on Monday, not Saturday, and 2) that I have food in my fridge that I want to use up. I will be "jarring" the extra, and will start fresh on Saturday. Money remaining for this week $33.89. So, though the day was odd, and quite challenging in many ways, I'm happy with how it turned out. And I'm happy I stuck to my guns!